Beauty Articles | May our skin grow beautiful, as we grow wiser. I’m sure you’ve all heard of the complicated Asian skincare routine. While some says that it originates from Japan, others argue that the Koreans have done this just as long as the Japanese. But no matter where this routine came from – most Asians ( unless those who are using American/European brands ) follow this skincare routine religiously. So what exactly is the Asian Skincare Routine ? This method is known as the ‘layering’ method , or known also as ‘millefeuille’ by the French. For the morning routine, only a one-step cleansing is enough! ( usually with Cleansing Foam). If you have used an overnight treatment or sleeping mask the night before, just rinse your face with warm water to benefit from the effects of the sleeping masks/treatment the night before. Follow up with the normal skincare routine. TIP : When applying toner, serum and emulsion – to maximize absorption use your fingers and continuously pat your skin ( as if playing the piano ). Note that there are different names and different steps that are used by different brands. For example, some Japanese brands apply the Milk ( which is sort of like an emulsion ) first before the toner. Korean brand, Sulwhasoo, starts with a serum right after cleansing, only to follow up with a toner after that. Take note that the Koreans name their toner by a few different names too such as Skin, Water, Skin Balancer, while the Japanese calls their toner by lotion ( but lotion to the Koreans is an emulsion ). The Japanese also love to use a method called the ‘lotion mask’. It is basically using your toner on a mask ( use cotton pads as the mask ), and leaving it on your face for a few minutes. It is also a more efficient way of using your toner, instead of just patting it on your face. We’ll be elaborating on this on another article! 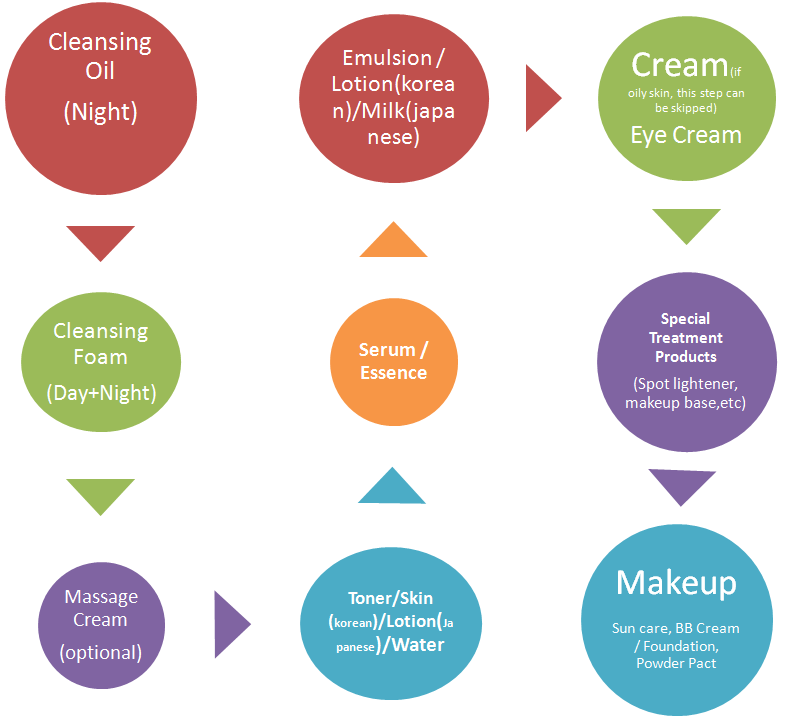 Ultimately, the Koreans call their emulsion as a ‘lotion’, but in Japanese skincare, lotion is usually the toner. You can skip the cream step if you have oily skin and stop at the Emulsion step. TIP : Warm the cream with your hands before applying it on your skin as your skin will absorb warm products easily. Ultimately, after applying your cream, rub your hands until they are warm and place them on your face. The heat will deliver nutrients easily into the skin, as well as making absorption easier. After your cream, follow on with Special Treatment Products such as Spot treatments, sleeping masks, wrinkle filler, etc. After the skincare routine, follow up with make-up by applying a sun care product , followed by either your BB Cream or foundation, and lastly a loose powder / powder pact / sun pact / BB pact. The night skincare routine is to nurse your tired skin, repair damage, etc. A double-step cleansing method is used to help remove make-up, sunscreens, powders effectively. Usually, a make-up remover that is oil based is used first. Cream cleansers ( if you have dry skin ) or foam cleansers are used in the second step. After cleansing, follow on with a massage pack/cream. These massage masks/cream help blood circulation and relieves stress. It is a good exercise for your skin as it stimulates the flow of oxygen and nutrients in your skin, improving elasticity of your skin. This step can be done 2-3 times a week, or even daily if you are motivated and have the time to do so. Great products that can be used for this step is the Whoo Jinyul Massage Cream, Sulwhasoo Fingerlinic Massage Cream, Whoo Nok Yong Pack, etc. Then follow on with your normal skincare routine. Note : If you are using a peeling mask ( such as the Whoo Brightening Peel-Off, or the Sulwhasoo Clarifying Mask etc ) , apply the peel-off mask only after the emulsion step. This is very important to protect the skin! TIP : To ensure better absorption and efficiency of products – ensure to tap using fingers ( as if playing a piano ) and also to warm up products by rubbing it in between your hands before applying it to your face. After that, rub your palms together until you feel some heat and place them on the cheeks (activation of Qi). Do the same for the eyes and the forehead. This step is extremely important when applying the eye cream!! The heat promotes blood circulation to your eyes and makes the cream more efficient. TIP : If you’re using a sleeping mask/treatment – just rinse your face with warm water the next day. The night skincare routine is the most important because your skin heals itself when you sleep and it is important that moisture is sealed so it doesn’t escape while you’re sleeping. A good night skincare routine will payoff when you wake-up in the morning! Chinese recognize 12 two-hour time units in a day the “12 earthly branches” – zi, chou, yin, mao, chen, si, wu, wei, shen, you, xu and hai. In a day, the 12 meridians are rivers of energy that carry qi through our bodies and the organ functions best when energy is focused there. Completing the activity, such as eating, at the right time, ensures that energy flows properly and the digestive system works at its best. Disrupted energy flow leads to health problems. People should be in deep asleep during both chou and yin. The liver meridian is on duty at chou to dispel toxins and produce fresh new blood in liver, while lung meridian is on duty at yin to distribute the energy and blood produced by the liver to the organs. Both jobs can best be accomplished while people are fast asleep. One of the classic and most important works written on TCM is “The Yellow Emperor’s Classic of Medicine”, thought to have been written by the emperor Huang Di, who reigned during the middle of the third millenium BCE (Ni, 1995). In this discourse, he explains that Qi takes its course through the 12 organ meridians over a period of 24 hours, spending two hours at maximal levels in each organ (referred to as the “twelve branches” theory) (Mao, 1993). In general, when treating a patient in accordance with this biorhythm, the best time to treat an excess of energy is at or shortly before the time of greatest meridian activity, while the best time to treat depleted energy is following the peak.